The mountain is a unique school of life. 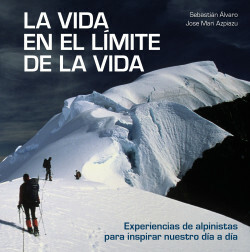 In this book, Sebastián Álvaro and Jose Mari Azpiazu collect the best reflections of renowned mountaineers, arising from favorable or adverse situations, often extreme but always unforgettable, that allow us to understand existence as it is: full of joys and difficulties, passions and failures. The experiences shared here, accompanied by the planet’s most moving photographs, encourage us to leave behind apathy and sadness, to develop the strength of the spirit, to trust in our values, to face obstacles without fear, in short, to live the adventure of life in all its fullness and intensity. The book includes more than 100 photographs and testimonies by Reinhold Messner, Walter Bonatti, Maurice Herzog, Junko Tabei and many other climbers. A book in the line of the collection 365 Thoughts/130 Thoughts, by Daniela and Olivier Föllmi, whose books never cease being sold. The volume invites us to celebrate life, our great adventure, and to overcome difficulties. The spectacular photographs taken all over the planet reinforce the messages conveyed. Climbers’ experiences to inspire our daily lives.